Much like other armies at the time, the U.S. Army envisioned two main roles for tanks: infantry support and breakthrough exploitation. From 1942 until the end of World War II, both roles were covered in the main by the M4 Sherman, which was better suited for the "cavalry" role. The infantry would have preferred a better protected and better armed vehicle, even at a price of less mobility. In late 1942, U.S. Army Ordnance started to work on an "infantry-oriented" design which was supposed to be more versatile than the British infantry tanks. 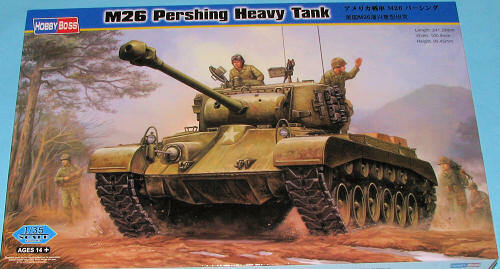 This now makes the third 1/35 Pershing that has been released, the other two by Dragon and Tamiya. Both of the other tanks are well done and one might wonder why a third is needed. Well, I'm not a marketing person so couldn't tell you but from the look of things, this kit is just as nice if not more so than the previous two releases. The overall molding of the kit is top notch. No sink areas, no flash and no ejector pin marks that will be seen after construction. Hobby Boss also takes the additional step of having no more than two sprues per bag and covers the delicate parts with protective foam sheet. Means no broken or damaged parts in shipment. There is no real indication of whether this is a WWII or Korean War Pershing and I don't know enough about the subject to tell the difference. However, I can tell you that there are a ton of parts and that the kit offers a full engine and transmission; in fact a complete engine compartment. If you wish to display your kit with the engine covers open, there will be a lot of detail to show off. Photo etch is kept to a minimum with just two pieces and those used as what looks to be anti-grenade screen. It appears that all the hatches could be posed open, but with no detail in the turret or the rest of the tank, I can't see why you'd want to unless you wished to fill the opening with crew members. As with many other kits of armor that use torsion bar suspensions, this one has all the bars and looks like it could be positioned in other than a flat position. The kit uses 'rubber band' type tracks. Each side is two pieces and the interlock is very good. I'm not sure if this is deformable styrene or vinyl as there is no indication either way. 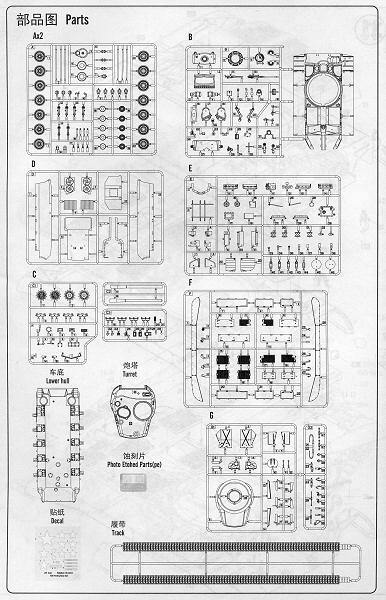 Instruction sheets are superbly done and with all the parts and construction steps, two full fold-out sheets are needed. Colors are all Gunze and generic references. The painting guide is full color and shows three overall olive drab tanks. Other paint references aside from Gunze are shown here. None of the three options is identified as to unit or place in history. All are pretty much generic stars with different serial numbers, though one is names 'Margaret 2'. Decals (not shown as they are boring), look to be well printed. My experience with Hobby Boss decals is positive so these should prove to be just as good. So now armor modelers have another choice for their Pershing. This one looks to be a very nicely designed and molded kit and I'm sure you'll be pleased with it. Thanks to Squadron Products for the preview kit. Get yours today at your local retailer or on-line shop.